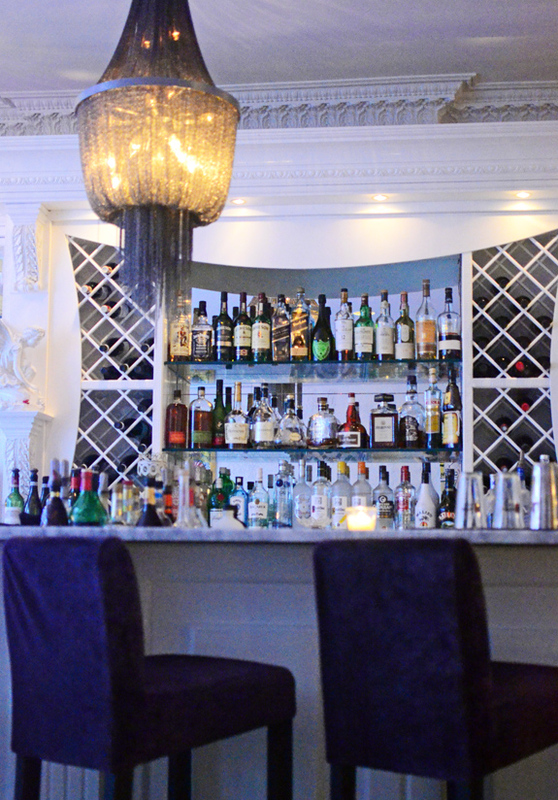 Well, classy may be a bit of an exaggeration, as the decor often flirts with kitsch. There’s the art near the entrance (the restaurant claims to double as a gallery), the picture of the owner with President Bill Clinton, the lounge area with furniture à la Onegin, the grandiloquent candelabra. And there’s often live music, with a recent performance by the Gipsy Kings (yes, they’re still alive). The downstairs dining room, however, shows more restraint. The menu has been through a few changes in the past weeks, but you can count on a solid selection of Georgian dishes — some of them I didn’t even know. The list as it stands today is a little weak on stews and mtsvadi (kebabs), and certain “Brighton Beach classics” have been added for variety, such as foie gras, tilapia, and tiramisu. Let’s get to the table. 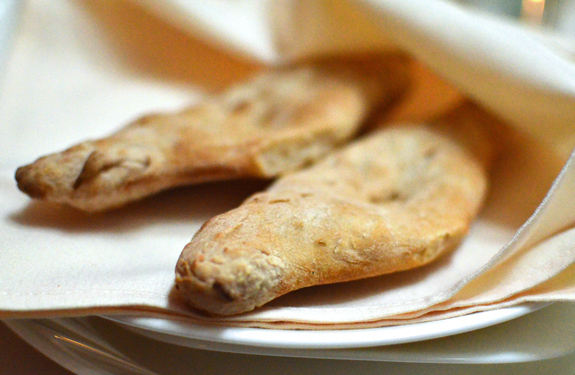 I know I say this all the time, but nothing can beat fresh bread served straight from the oven. And Pepela’s Georgian flat bread (made with a yeast dough, despite its shape) tasted very good indeed, even though the crumb was too compact. I think it might be brought to the table only with certain appetizers, but you can always ask for it. There are, of course, several other kinds of breads to be had. Starting with cheesy khachapuri. 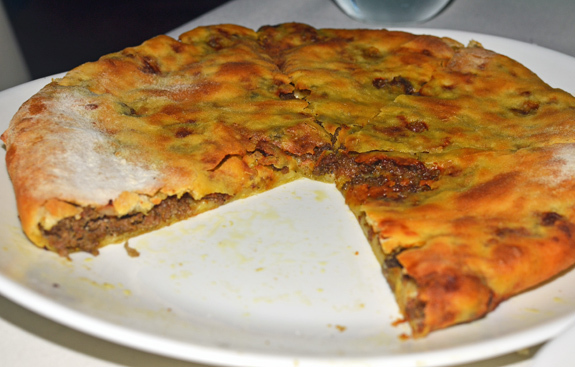 We tried the Adjaran kind, which was very good because it doesn’t have too much dough. The cheese looked and tasted Georgian enough, not too salty and not too bland; most likely not a blend of “foreign cheeses” such as mozzarella and feta. I wished the dough had been slightly closer to bread dough, with more flavor, but that’s a quibble. We also tried the Mingrelian version for good measure (not on the same day, mind you). It featured the same cheese mixture, with extra cheese gratined on top. The bottom wasn’t colored at all and was a bit too soft (typical signs of an oven that’s not hot enough), but the bread was still good and satisfying. I often order one as soon as I arrive, so that it comes before the appetizers. And we tried a kubdari, too! 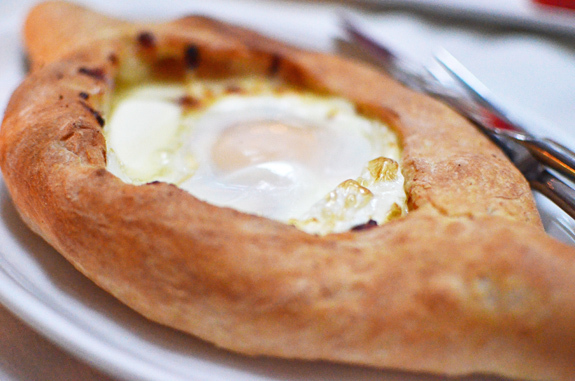 This is basically a khachapuri with ground beef, onion, and curry (or possibly khmeli suneli?) instead of cheese. Although pretty good for what it was, it didn’t create the same kind of addiction as its cheesy sibling. Be careful to note before you order it: it’s quite big, even for two. 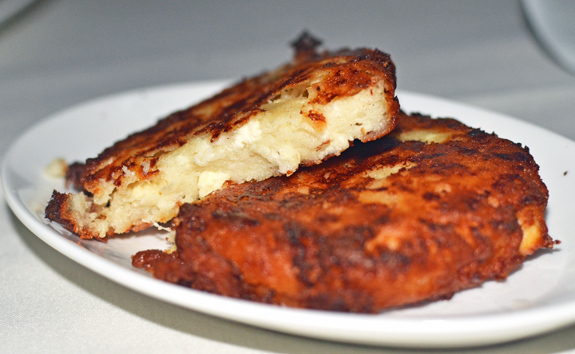 Hailing from remote Svaneti, the chvishtari felt a little bit less like a bread and more like a very rustic pancake. 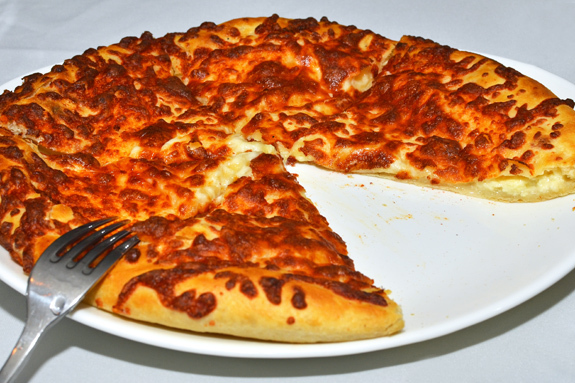 Pretty heavy stuff, where the cheese brings a tangy note to the dominating cornmeal. I think it was a pretty authentic chvishtari, but this is really a rare mountain subsistence dish, not something very exciting. The large cold appetizer trio is a good way to discover Georgian food. The essential eggplant rolls with walnut, spices, and pomegranate tasted very good. The beet pkhali with walnut struck the right ingredient balance, being neither too dry nor too thick. 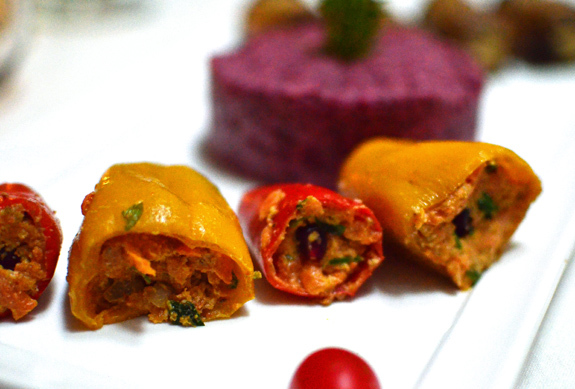 The third element of the trio, small peppers stuffed with carrots and walnuts (again), was less interesting, and slightly bland as it lacked seasoning. Because one of our meals here happened to be on National Caviar Day, we decided to indulge ourselves with a quite affordable $48 Caviar Ossetra. While we were told we’d get 2 oz, I evaluated the portion as something closer to 1 oz, Still, it was reasonably priced. The caviar was a bit salty, without much of a lingering fish roe taste. I have to wonder if this was really ossetra or just some other lesser species of sturgeon — which is what osetr actually means in Russian. The accompaniments were a bit weak. 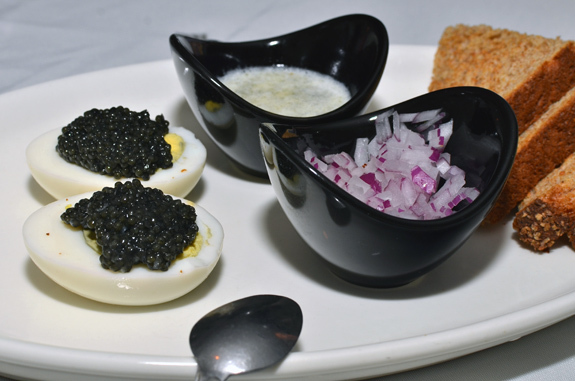 I usually don’t eat black bread, hard boiled eggs, or raw onion with my caviar. The chicken baje, a simpler version of satsivi, was well done but not fork-tender, and contained a lot of bones. For once, I would have preferred boneless chicken — somehow that makes more sense to me in an appetizer. Also, the dish wasn’t served cold as announced on the menu, probably because the 2 lonely cooks in the kitchen had to prepare next to everything at the last minute. 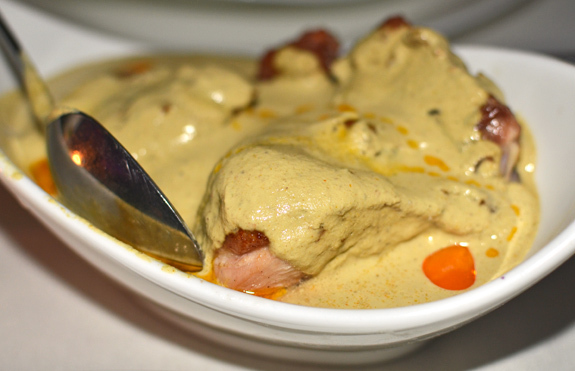 The pleasant sauce tasted of walnut, garlic, and curry, maybe thickened with cream. Why the menu called it a vinaigrette is beyond me. While lobio is a popular Georgian bean dish, I must confess I’ve hardly ever eaten it. This rendition made me regret that. 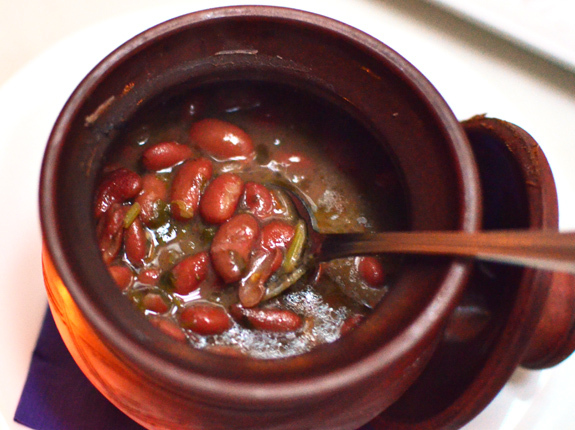 The beans, stewed with tarragon, were very tasty. Here again, the menu had taken a questionable license by calling the dish a bisque. The owner seems to like using French words regardless of their actual meaning. Soko Ketze means mushrooms in clay pot in Georgian, I believe​. 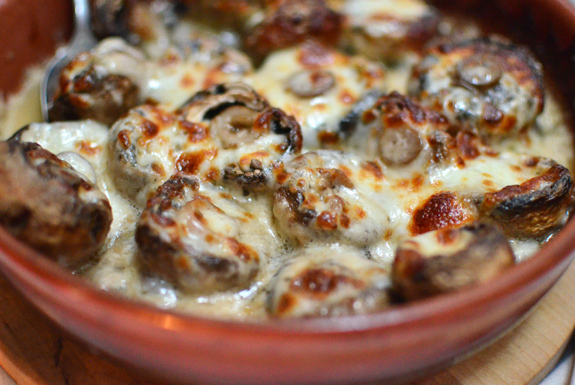 This describes the dish pretty well: a flavorful mushroom cheese gratin, with cooking liquid from the mushrooms at the bottom. If it was smaller, it would probably be better suited as a side dish than a hot appetizer. 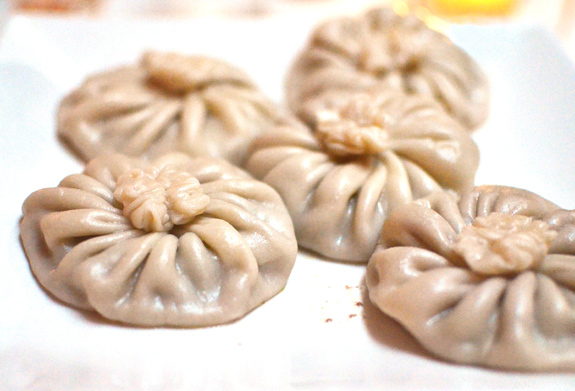 The khinkali (Georgian meat dumplings) on the other hand, were not my thing. Unlike many renditions, they didn’t have too much dough, but unfortunately the small filling patties in the middle contained way too much herb (parsley and cilantro, I believe). I mean, really, to the point where I couldn’t even tell you what meat they were made of — a mix of beef and pork, maybe? 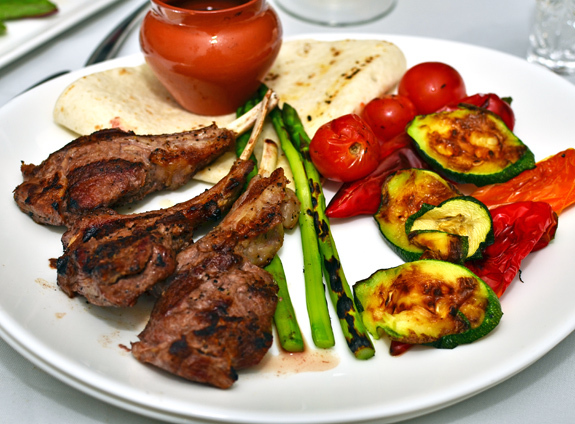 The lamb chops were disappointing, as well. Ordered medium rare, one of them came more or less medium rare and the others medium well. They were also pretty small, certainly not from the center of the rack. Lamb chops from your butcher look nothing like these, especially for $30. It’s sad that the sides (asparagus, zucchini, peppers, and tomatoes) came cold, because they tasted good and were well prepared. 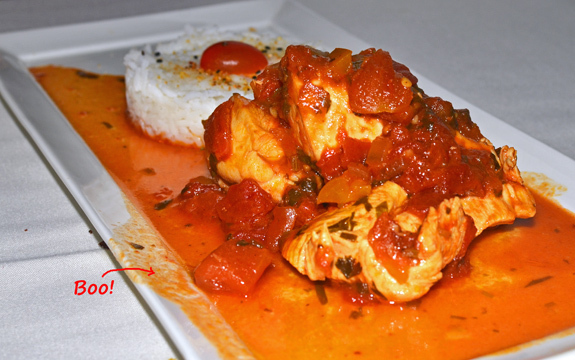 The chicken chakhokhbili consisted of morsels of chicken breast in a sauce made of tomatoes, onions, and herbs. I was expecting a stew with pieces coming from a whole chicken, as it is typical in Georgian recipes. Unlike the chicken baje appetizer, a few bones would have been welcome here. Instead, the chunks of commercial chicken breast felt like they were simply cooked to well done and then tossed in at the last minute. Otherwise, the sauce tasted good. The rice was plain boiled white rice. The veal ochakhuri was much better. Ochakhuri means family (I’m quite the Georgian language expert today! ), and this was something to eat family style. Simple but very flavorful, and obviously made fresh. 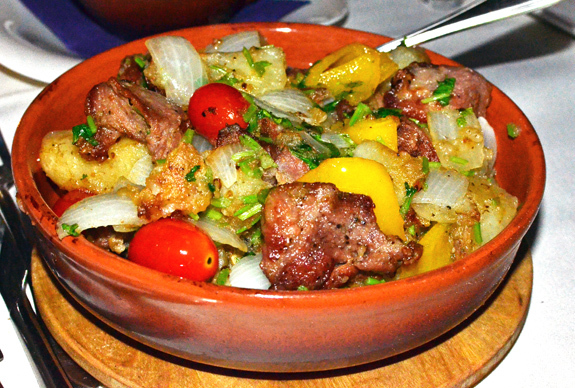 The bottom of the dish was full of tasty meat juices; the potatoes, mixed with onion, tomatoes, and parsley, were fork tender; the meat was well seasoned, but I wish it had been cooked a bit longer, and not in a pan. Pan-frying meat might be something you do at home, but it’s just not a good way to cook it. Similarly, I remember hearing a lot people offering (or just making) “pan-fried” shashlyks in Georgia —a heresy of the modern kitchen. 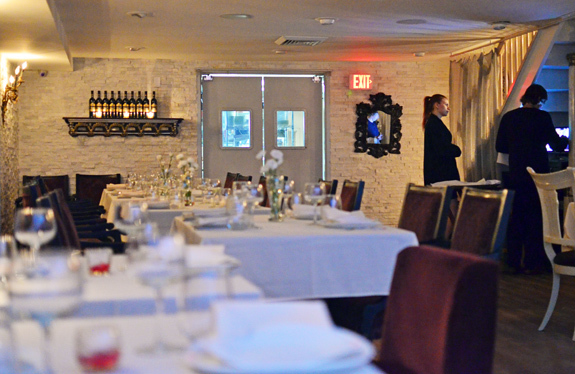 Our latest visit to Pepela fell right during the “debut of [their] European dessert menu” — unfortunately for me. 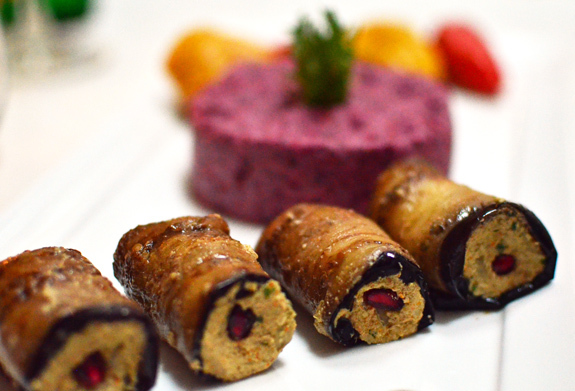 The pelamushi (“a Grape Georgian Delight”), the only Caucasian dessert on the list, was sold out. 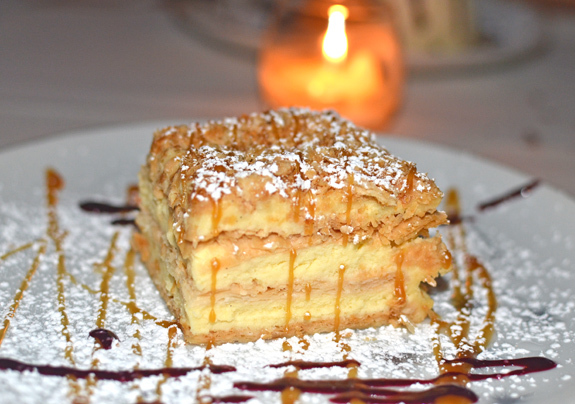 The napoleon encased some very thick, unflavored cream between layers of filo, with lines of berry sauce and very sweet orange sauce (I’m not sure if orange was the fruit or just the color). It was almost like a cheese cake. It didn’t taste bad at all, but was rather boring. 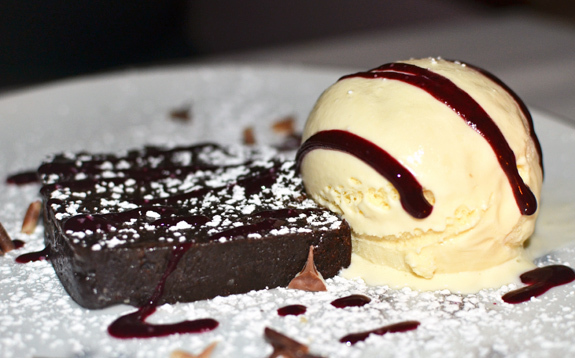 The chocolate cake was really more like a sludgy chocolate fudge, served with good vanilla ice cream and some berry sauce again. This was rather disappointing, because without a real chocolate cake, it didn’t really constitute a working plated dessert — too many similar textures. 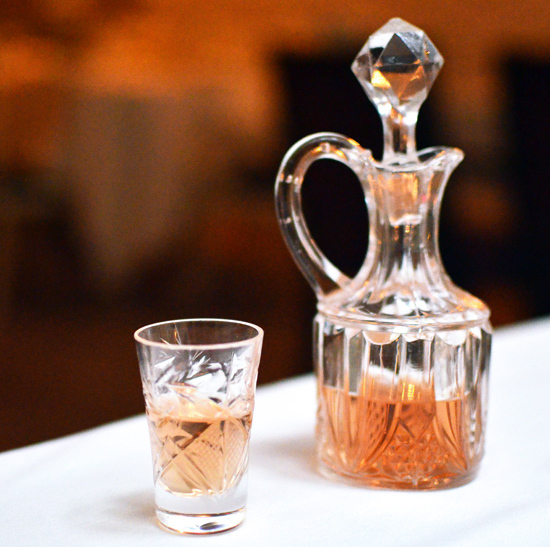 On the beverage front, there’s a small selection of better Georgian wines that are worth a try. Pepela also makes a few flavored chachas that are not as strong or as reminiscent of wood alcohol as the plain kind (this is something that always surprises me: Italian grappa and Georgian chacha are both grape brandies, and yet they couldn’t taste more different). The pomegranate chacha was slightly sweet and pretty nice. The tarragon chacha reminded me of zubrovka, but smelled of tarragon instead of bison grass. This is it! As you can see, I must have tasted over half of the menu before writing this review. 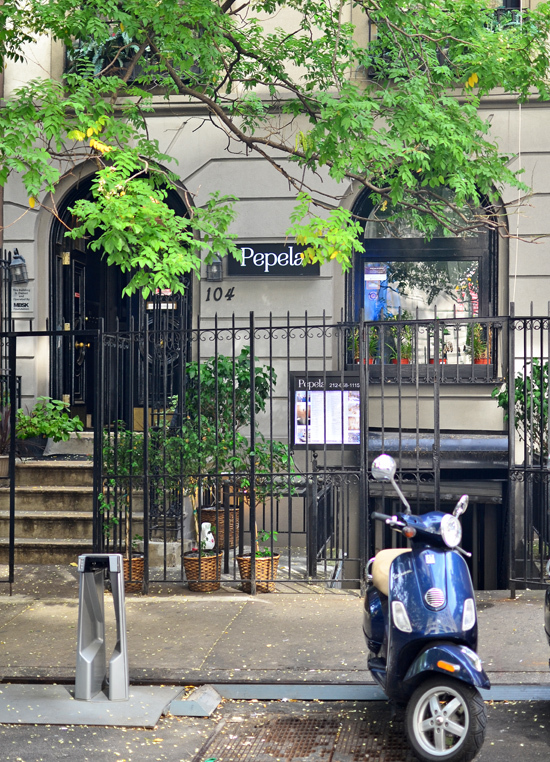 Georgian restaurants are rare enough, and the quality at Pepela was good enough, that the joint was worth further investigation (also, I love Georgia). The verdict is rather positive. The cuisine is fresh and authentic, and I didn’t notice anything coming out of a can. The main flaw in my opinion is the understaffed kitchen that can’t possibly deliver such an extensive menu in a half-empty restaurant without leading to an excessive wait or some compromises on quality. And the new dessert menu is not a step in the right direction: if I want to eat a bland napoleon, I can just hop on the Q train.